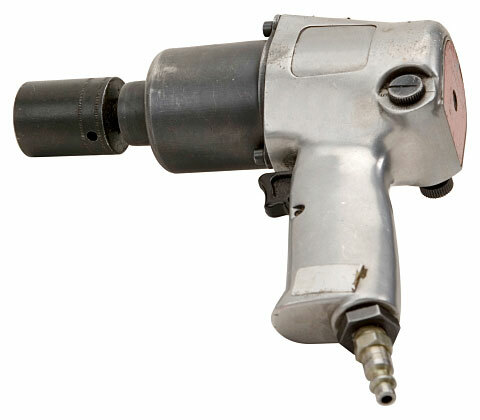 This photo depicts a compressed air-powered impact wrench. Auto mechanics often use these types of pneumatic wrenches to quickly and easily remove and install lug nuts on automobile wheels when rotating wheels or changing tires. If you've ever struggled with loosening or tightening nuts and bolts, the pneumatic wrench may be the answer to your challenges. An air-powered impact wrench is a reversible, hand-held wrench that spins freely between 2,500 and 15,000 rpm. It can loosen or tighten nuts and bolts, and is controlled by either a two-way trigger or a separate switch. Because it is relatively inexpensive, it is a favorite tool among auto mechanics, carpenters, and at-home do-it-yourselfers. In addition to saving the user's hands, it also saves a significant amount of time. In order to use the wrench, the user presses the trigger. As soon as the socket meets resistance, a spring-loaded hammer strikes an anvil attached to the drive shaft. This causes the socket to spin until the nut is free. On most wrenches, the speed and torque of the tool is adjusted via a built-in regulator. It's important to know that the torque on the regulator is not precise. If precise torque is required, the job should be finished by hand using a torque wrench. Impact wrenches are safe as long as you follow certain safety rules. Because metal parts are prone to flying off when the wrench is being used, it should never be used without safety glasses.